World Water Day is upon us and serves as a great time to reflect on the essential, life-giving resource that we all rely on for survival. According to the World Economic Forum, water crises are the single most impactful risk that the world faces today. Our need for clean water is a vital link connecting humans and wildlife to the planet, from the Flint, Mich., water crisis, to major oil spills, we have all seen the tragedies that can occur when we do not act as responsible stewards of our precious water systems. Wetlands, or areas like bogs, marshes or swamps, are not only where water meets soil, but also serve as natural sponges that filter out harmful pollutants and purify water. These areas also are some of the most productive ecosystems in the world and are essential, yet fragile, habitat for many species of marine and terrestrial plants and animals. 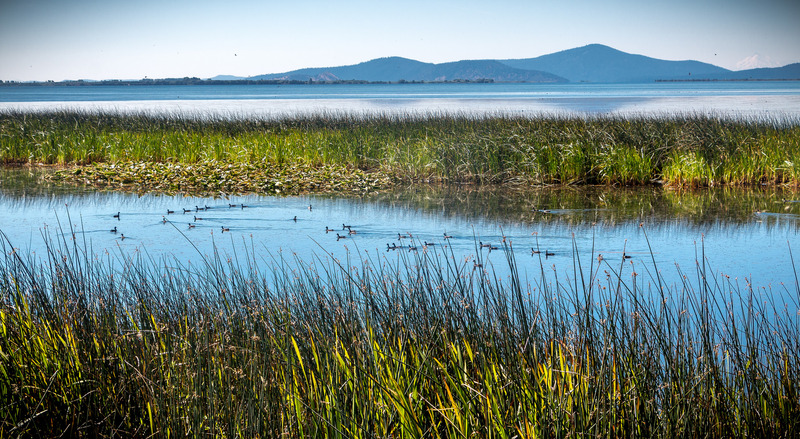 Wetlands are dynamic protectors of coastal communities and stand as the first line of defense against major storms, winds, flooding and tidal forces, protecting against coastal erosion. Despite the valuable services wetlands provide, we are witnessing their decline at an alarming rate, leading federal agencies like the Council on Environmental Quality (CEQ), Environmental Protection Agency (EPA), Fish and Wildlife Service (FWS), National Oceanic and Atmospheric Administration (NOAA), United States Army Corps of Engineers (USACE), and United States Department of Agriculture (USDA) to collaborate and take action to increase monitoring and protection of these areas. Since the 1980s, the FWS produces reports roughly every ten years on the status and trends of wetlands in the U.S. The first report completed analyzed data from the 1950’s-1970’s, and found that the lower 48 states were losing almost 500,000-acres of wetlands each year. The following report from the mid-1970s to mid-1980s showed a decrease in the amount of wetland loss due to the passage of the Clean Water Act and the Wetland Conservation Provisions of the Farm Bill. This trend of reports citing decreased wetland loss progressed into the 1990’s and early 2000s, when one report stated the lower 48 states were gaining wetlands each year, a report that gave scientists pause, motivating them to take a closer look at the data. That report spurred the formation of the Interagency Coastal Wetlands Workgroup (ICWW), chaired by the EPA and comprised of more than a dozen representatives from six federal agencies. “We were shaking our heads saying, “that [wetlands gain] is not what we are seeing on the coastal parts of the country.” So, we partnered with the FWS to resample all the data they had for that national report for just coastal watersheds,” said Susan Marie Stedman, Wetlands Scientist with NOAA’s Marine Fisheries Service. And after the resampling process, the same data that showed the nation, as a whole, was gaining wetlands from 1998 to 2004, revealed that coastal wetlands were being lost at a rate of 60,000 acres per year – principally in the South Atlantic and parts of the Gulf Coast. 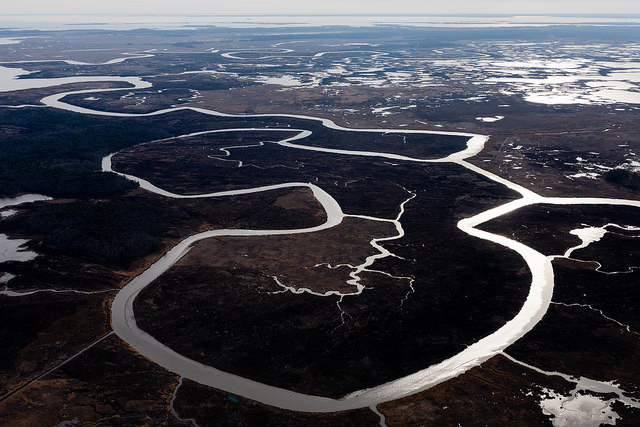 An aerial view of Blackwater National Wildlife Refuge shot by Will Parson, Staff Photographer for the Chesapeake Bay Program on March 20, 2017. Currently, the workgroup has draft recommendations that address the need for more coastal wetland restoration and call for further research to help foster a deeper understanding of what is happening in our nation’s wetlands. The workgroup will develop a suite of comprehensive recommendations that address the lack of current restoration efforts in coastal watersheds and are trying to get agencies to distinguish the type of wetland restoration they are engaged in. There are two types of restoration, rehabilitation – the act of improving wetland function through it cleaning up – and reestablishment – increasing wetland acreage bringing back areas that once were wetlands that may have been lost to drying out or development. “One of the things that I think we need to think about in terms of restoration in coastal watersheds is, if we are losing wetland acres to development like houses, shopping centers, and roads and we are compensating for that loss through rehabilitation, then our net is a loss of wetland acres and we are losing wetland function. If you are not keeping track of that, then you don’t know what you are actually getting back for acres,” Stedman added. Coastal watersheds make up close to 40 percent of the wetlands in the lower 48 states and represent the areas where most of the loss is occurring. Currently, only about 10 to 15 percent of the acres gained through wetland restoration in the country is in coastal regions. Agencies attempting to restore wetlands in coastal areas face the challenges of accessing federal dollars, leading them to seek efficiencies through resource sharing. Additionally, much of the restoration happening in costal watersheds is not replacing the acres we are losing, but restoration is taking place in the form of rehabilitation rather than reestablishment. The workgroup is working to reduce the loss of wetlands in coastal watersheds by developing recommendations that can be implemented in partnership with the states. Although, this is process is still in its development phase, Stedman notes that the process has already fostered important partnerships between federal and state agencies like the U.S. Forest Service. “We are not done and we have missed our deadline by a couple of years at this point, but the process of engaging in this study and drafting this set of recommendations has generated some really interesting and important data that has initiated some really important partnerships going forward,” Stedman concluded. The NOP calls for federal agency relationship building, coordination and collaboration to address key ocean challenges. It provides states and communities greater input in Federal operations, saves taxpayer dollars and promotes economic growth. The establishment and actions of the ICWW stands as a notable example of Federal agencies reacting to the NOP’s charge, setting in motion a culture of collaboration and resource sharing. The efficiencies of these actions allow scientists, stakeholders, and decision makers to make better, more informed decisions regarding not only our nation’s wetlands, but also our oceans, coasts, and Great Lakes in order to sustain them for generations to come.